Hello! 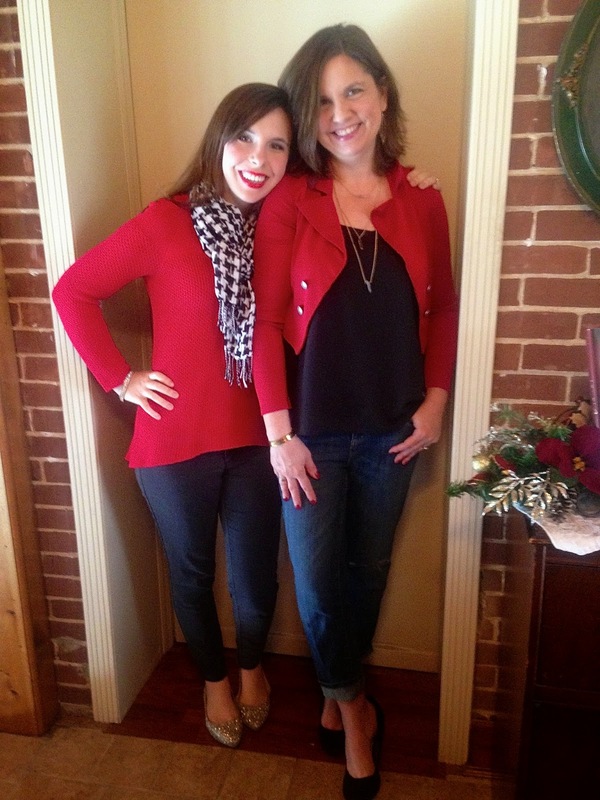 As promised, this week's Fashion Over Fifty topic is a Mother/Daughter post. My daughter Ashley was home for Christmas and brought enough clothes with her that we were able to play 'dress up' for days. We had so much fun putting outfits together and taking pictures. And the hubby didn't mind taking our pictures at all, as long as it was during a commercial while watching a game. 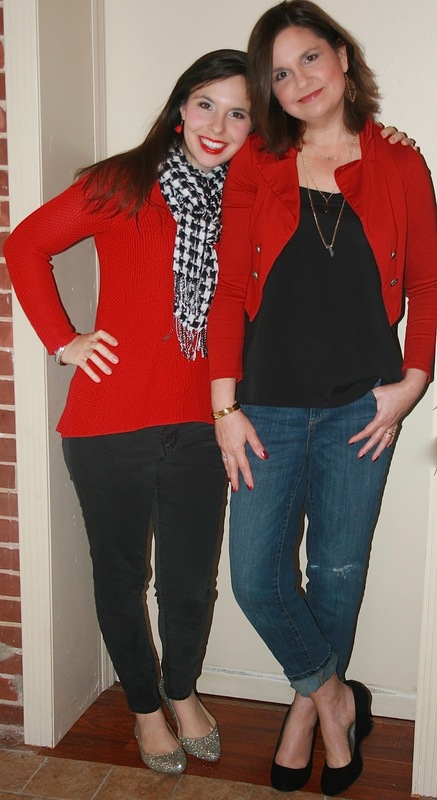 We decided to go with matching red outfits since it was the holidays. To break the myth of 'age appropriate dressing', we switched clothes. Ashley is wearing my sweater, scarf, and shoes, and I'm wearing her red jacket. You probably saw the sweater Ashley is wearing in THIS POST. In that post I paired the sweater with one of Ashley's fun skirts. 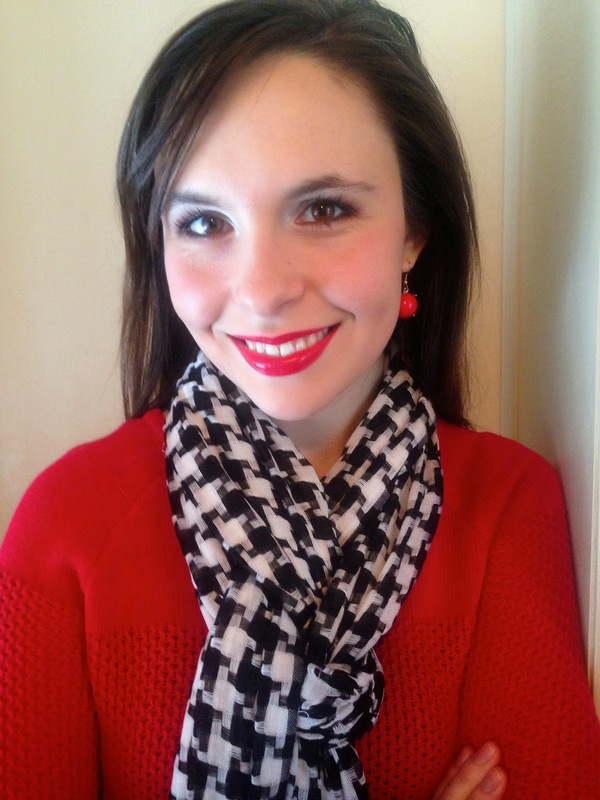 Ashley chose to pair my red sweater with dark jeans, a hounds tooth print scarf (old), and gold flats from Old Navy (sold out). 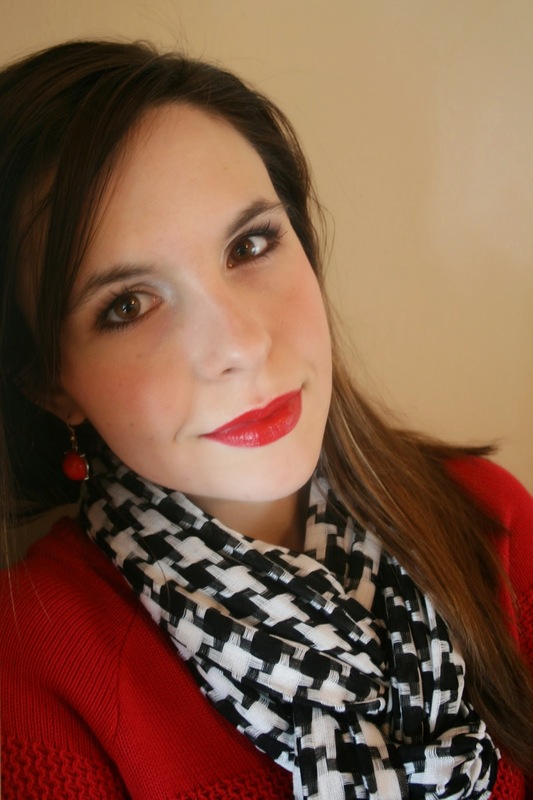 Ashley put bright red lipstick on because it looks great with her skin tone, and it also went well with her outfit. 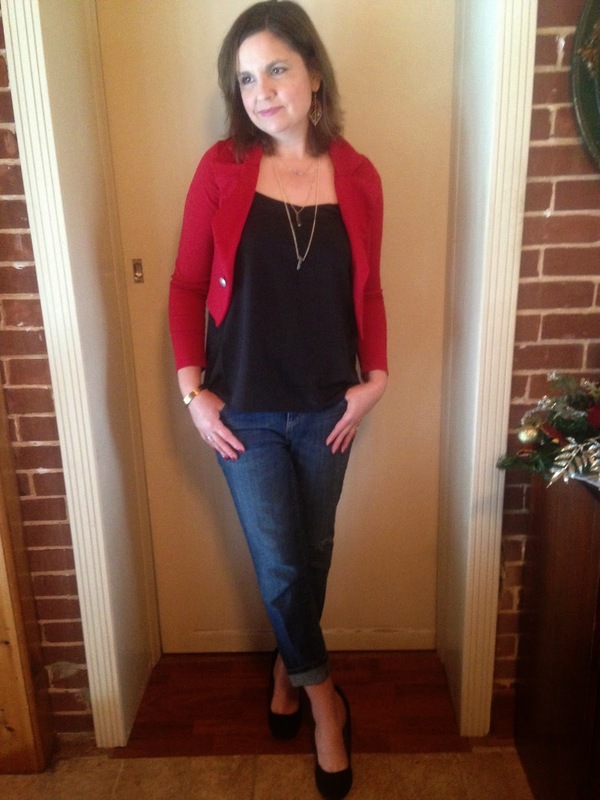 I paired Ashley's red jacket with a blue camisole from Old Navy, dark, distressed boyfriend jeans from JCP, and black suede wedges from Famous Footwear. 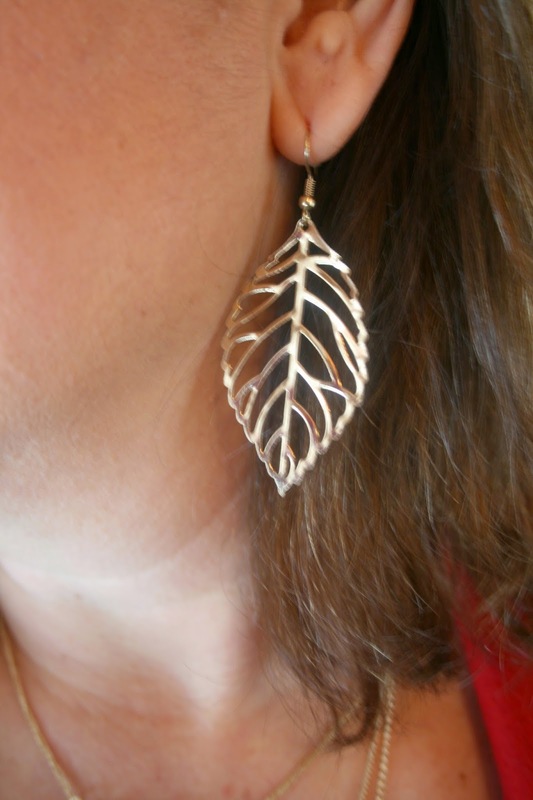 For jewelry, I wore a big earring shaped like a leaf (old), a gold bracelet from Stitchfix, and a multiple strand necklace from Express (sold out). Ashley's jewelry was her own round red earrings (shown in the first close up), gold and diamond bangles of mine (old), and her unique ruby wedding ring. "I despise the term age appropriate. I wasn't appropriate 40 years ago and I'm not about to start caring about social conventions now! I wear what I damn well please, and hopefully I look fabulous in it." I couldn't agree more Dorrie! If you'd like to see this amazing woman's fashion style, check out her blog HERE. She's gorgeous, and I love the way she dresses! You've heard me preach many times before that dressing appropriately isn't so much about age, but about body shape. Wear what looks good on you! I absolutely cringe when people in the fashion industry use the phrase 'age appropriate'. I find it quite offensive actually, that someone thinks they have the right to tell me how to dress by my age instead of my body type. And really, why is this an issue anyway? Do we really see women dress inappropriately for their age, or are we seeing older women dressing immodestly and we confuse the two? About a year ago I was attending my son-in-laws graduation from graduate school when I saw a woman my age wearing a very short, tight fitting dress. I said to my husband 'Now that's an example of a woman not dressing her age!'. But I was soon convicted because when I thought more about it, I realized it wasn't her age that was the problem, it was her dress! It was not the proper dress for the occasion, it was something one would wear to a nightclub in Miami, not a graduation ceremony. Even a twenty year old would have looked inappropriate wearing that dress. Would I wear the outfit Ashley is wearing above? Absolutely! And I have! Would Ashley wear the outfit I have on below? You bet! Don't let your age dictate what stores you shop at, or what styles to wear. 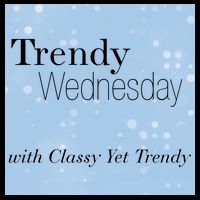 If you like a certain trendy style, try it! I was afraid to try distressed boyfriend jeans because I thought they were too young of a look for a 52 year old. But you know what? I wear these jeans more than any other pair of jeans in my closet because they are so COMFORTABLE! I love the looser fit. My only problem with them is that the little hole in the leg that was there when I first purchased them has grown into a huge hole because I wore them so much. If I buy another pair of boyfriend jeans, it will be without the holes, because I seem to have no problems putting holes into my jeans on my own. 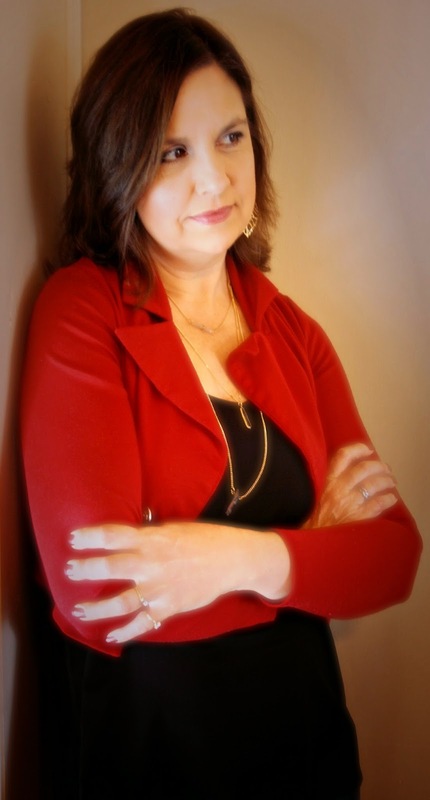 As older women, we often feel we have to step aside and let the younger generation take center stage. We seem to disappear in the shadows only to be seen in ads where grandma is plump and happy with an apron on and serving others in the kitchen. Even stores that are geared towards seniors, feature young models in their ads. Have you seen Chico's latest spring ad campaign? There is not one single model over the age of 30, if they are even 30! Did you know the average age of the Chico's customer is 52? Well, where are the fifty something models? It's sad really. That the stores that take our money can't even have the decency to feature models who are the same age as their consumers. I see the term "age appropriate" used in the media all the time, and I think it's a thinly veiled attempted to make us feel self-conscious about our beauty and sexuality once we hit a certain age, and that is not okay. Your right Dorrie! It's not okay. Thanks for posting your beautiful pictures and speaking out for older women. I appreciate that! I'd love to hear your thoughts on the term 'age appropriate'. What do you think? Is there such a thing as 'dressing too young' or are we confusing 'immodest' dressing with the term 'age appropriate'? You both look absolutely beautiful Amy. You do not look like you are 25 years older. The red look beautiful on both of you. Amen, sister! What a great read. You both look beautiful and I love the fact y'all swapped clothing to help prove your point! You both look so lovely in red. (ARGH!! I wish I could edit my comment! I think I wrote Stephanie and I meant AMY! SO sorry!!) It's Friday, my brain is fried! I love that quote! Both you and your daughter are so gorgeous! You look more like sisters! You two are so cute in your matching red outfits! Oh, I just love this! What a great idea... hope my daughter will want to do fun things like this when she gets older. 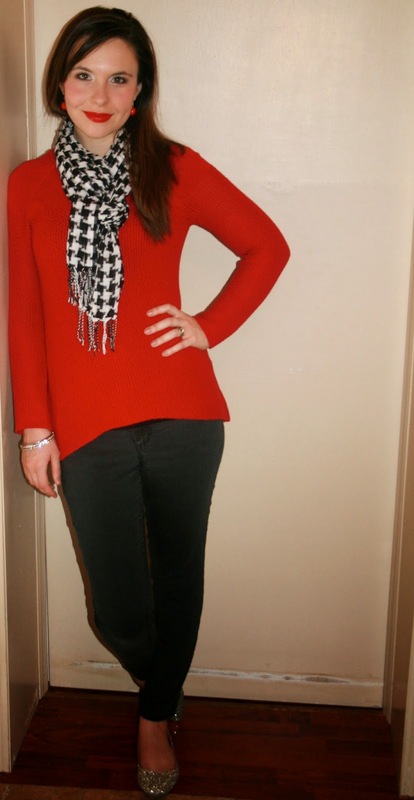 :) I love red on both of you, that scarf is gorgeous and I want those wedge black shoes! You both look so pretty! Such fun to dress in each others clothes.